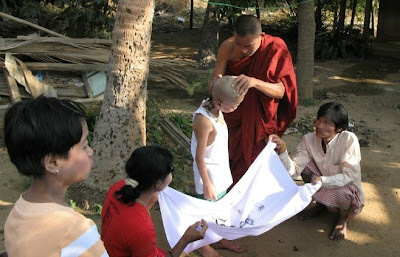 A "Procession" at Myinkaba Village just south of the walls of Old Bagan to mark the indoctrination of young boys into monks. 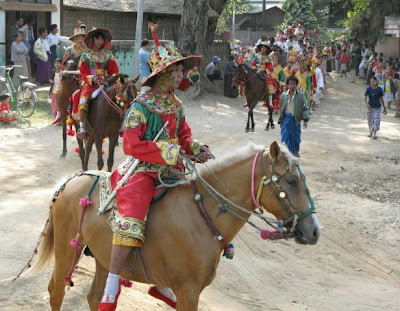 We just happened onto this celebration one morning as it snaked its way through the village, parading the young boys all dressed in the finest colorful silks, with faces fully made-up, including rouge on their lips. 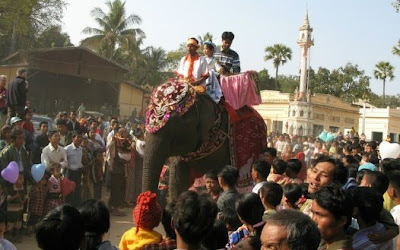 It was quite a spectacle with just about everyone in the village turning out to march or watch. 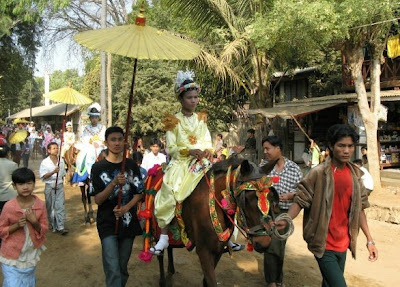 It was pretty much a family affair as Brothers and Sisters all marched alongside their young siblings as they made their way over the dusty dirt paths of the village towards the temple. 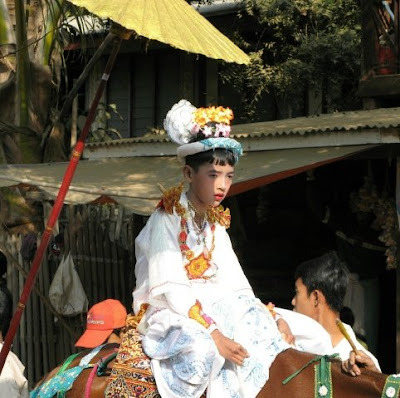 Only boys from the most well off families rode atop elephants. 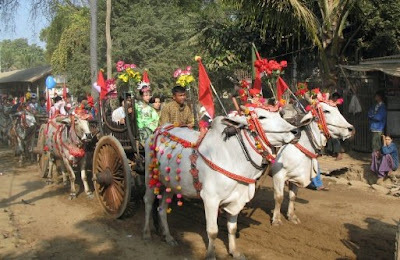 They were followed by boys on oxcarts and horses. 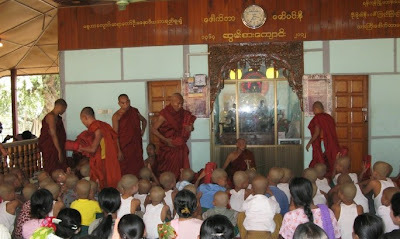 After the procession, the boy's heads were shaved by the elder monks. Family members collected all the shavings and what they did with them was a mystery to us. 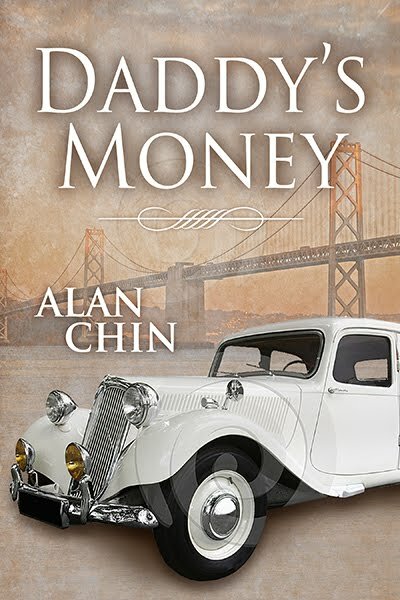 They were wrapped neatly in a large white piece of cloth and stacked-up on the inside of the temple. Red cassocks were finally handed out to the boys towards the end of the ceremony. I'm sure it was a day they will not soon forget. I know we will remember it vividly for a long time. 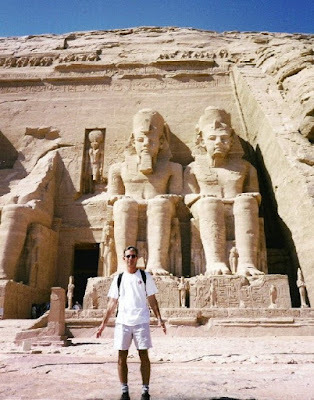 We’ve traveled to destinations within Egypt on several occasions over the past decade, visiting Cairo, the Great Pyramids at Giza, the grand temples at Luxor and Memphis, the tombs in the Valley of the Kings (and yes, the Valley of the Queens), even scuba-dived at Sharm el Sheikh on the Red Sea. 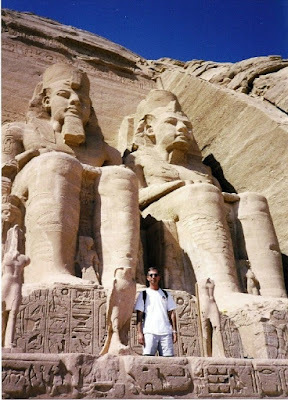 But no destination in our many trips to this desert country was more pleasurable than our excursion to what is undoubtedly the second greatest sight in all of Egypt, the temples at Abu Simbel. 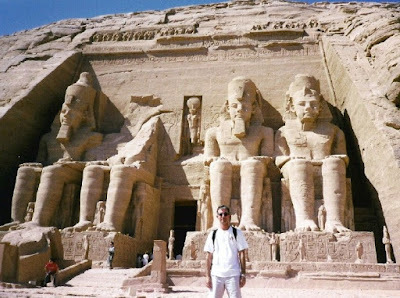 Our journey began with a flight from Cairo to Aswan, the closest town to Abu Simbel. 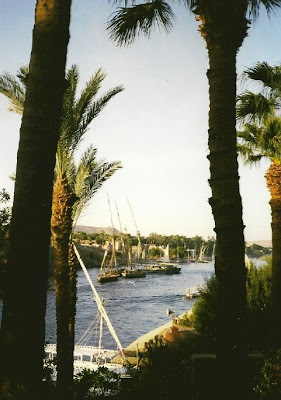 Aswan is a dream nestled beside the Nile, just below the site of the old British-built dam. Its inhabitances flow to the rhythms of the river: slow, graceful, and steady. 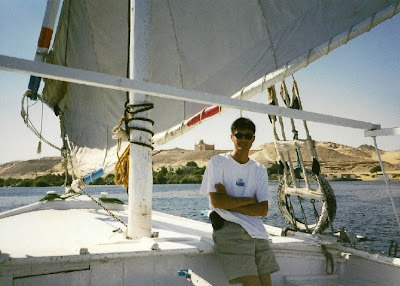 Time gets all jumbled there, as it’s not uncommon to see someone using a cell phone while sailing a felucca. 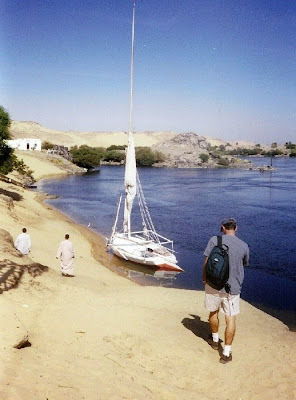 The most wonderful experience we had in Aswan was sailing the Nile on a shallow-tailed felucca. These grand old sailing ships, large enough to carry a half-dozen passengers, gracefully glide on the river. There is nothing quite like holding the tiller while the breeze moves you over the water, noticing the movement of the palms, the children playing on the river’s edge, a flight of hoopoes.The first day we sailed in a felucca, our guide took us upstream, towards the dam, to a Nubian-speaking village. 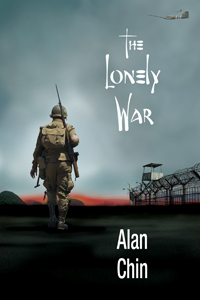 The houses were either pale yellow or brilliant blue; the eyes of the young men were alluringly black. Some doorways were carved with crocodiles at the foot, fish in the middle, and a man at the top. 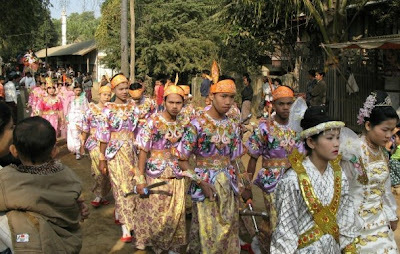 We followed the dirt pathways that snake through the houses and were invited to tea by a resident of the village. 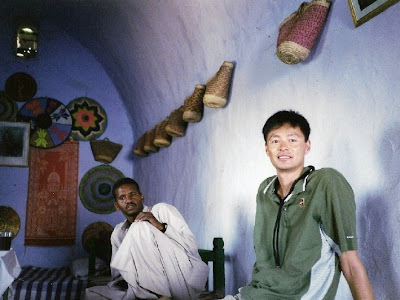 We were ushered into his comfortable hut, drank strong tea and smoked a water pipe while trying to communicate with our host, which turned out to be a difficult undertaking. 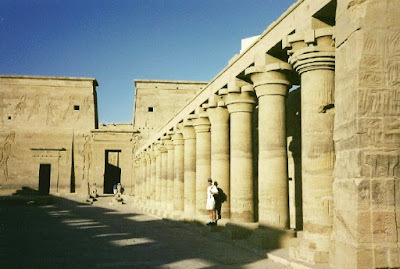 There are a number of temples and tombs in and around Aswan to explore, most notably, the temple at Philae. We took a boat out to this island and spent an interesting few hours admiring the stone monuments. The temple of Isis was by far the most interesting of the structures, but to be honest, we can’t remember much of what we saw there. 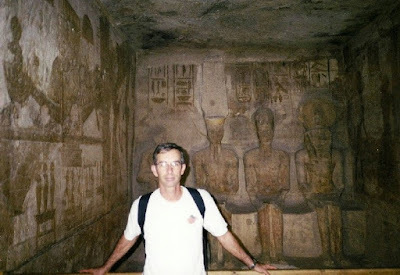 We took a 25-minute flight from Aswan, to visit the two temples at Abu Simbel. These structures, built in the 13th century BC, are situated in the middle of the desert on the western shore of lake Nasser, with virtually nothing else around them but sand and water for 300 kilometers. 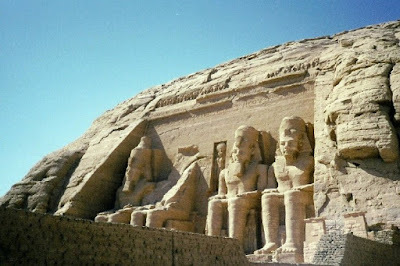 The temples are part of the UNESCO World Heritage Site known as the “Nubian Monuments” which include a number of less significant temples scattered down river from Abu Simbel to Aswan. From the Hypostyle Hall, we entered a second, smaller pillared hall, which has four pillars decorated with beautiful scenes of offerings to the sun god. There are also depictions of Ramses and his queen, Nefertari. A remarkable thing about this temple, besides its shear size, are the hieroglyphics in the second Hall. Not only is the detail extraordinary, but the color is still vibrant, more so than any of the hieroglyphics we’ve seen in all of Egypt. From the second hall, we entered into the back sanctuary. Here, on the black wall, are stone sculptures of four seated god figures: Ra Harakhti, the deified king Ramses, Amun Ra and Ptah. There was very little light in this back chamber, which gave it an eerie feeling. Twice a year, on October 22 and February 22, the first rays of the morning sun would shine down the entire length of the temple cave to illuminate the innermost shrine where the statues of the four gods are seated. The most remarkable thing about both these temples is that they were originally built in a different location. 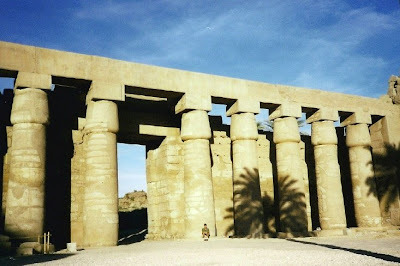 After the Aswan High Dam was constructed across the Nile, the rising waters threatened to swallow these temples. But in the spring of 1965, workers injected the sandstone with synthetic resin and hand-sawed the entire complex into 1050 massive blocks. By the autumn of 1967, all the blocks were moved and reassembled at the current site -- 210 meters from the old site, and 61 meters higher. 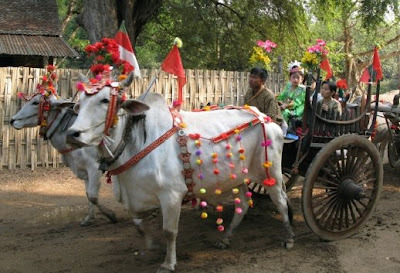 UNESCO funded the $42 million dollar project. The impeccable reconstruction and relocation of the temples is remarkable. You can look for the filled-in joints but can’t find them. Everything is as it was before, except that behind the mammoth facade, and holding the entire structure together, as a way to simulate the mountain it was carved into is a massive hollow dome. It is truly an engineering marvel, in addition to being an historical treasure. 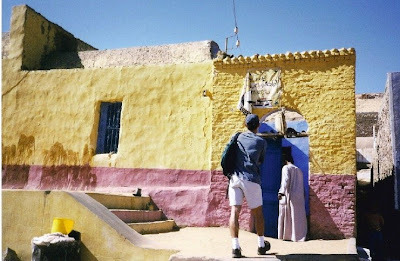 We were only at the temples for a few hours before the bus whisked us back to the airport for our flight back to Aswan, but those few hours were as mystical as any we’ve experienced on our travels.